Place thawed strawberries in blender container; blend until pureed. In large bowl, beat cream until soft peaks form. Add strawberry puree and condensed milk; stir gently to mix. Fold in chopped strawberries and walnuts. Fold in cake pieces. Pour mixture into ungreased 13x9-inch (3-quart) glass baking dish; spread evenly. Cover with foil; refrigerate 8 hours or overnight. Garnish each serving with strawberry fan. To toast walnuts, spread on a cookie sheet; bake at 350°F. for 5 to 7 minutes or until golden brown, stirring occasionally. To make strawberry fans, select firm berries with stems. Starting at the tip of the berry, cut thin slices into the berry almost to its stem. Spread the slices to form open fans. 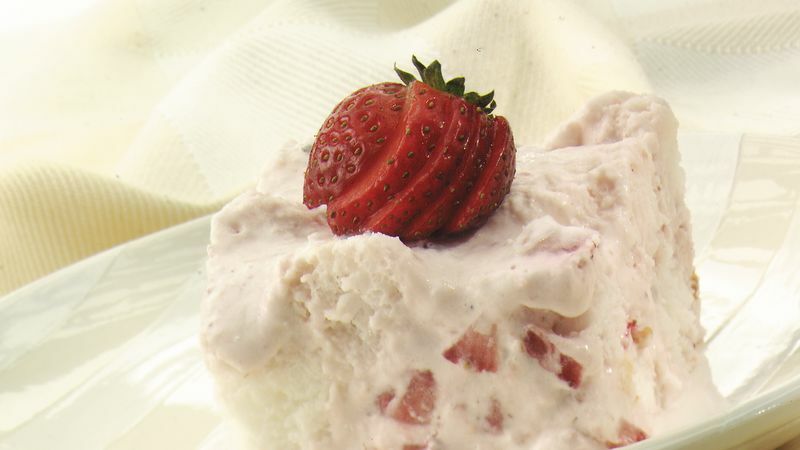 For Frozen Strawberry-Walnut Angel Squares, instead of refrigerating this dessert, freeze it. Just before serving, transfer the dessert to the refrigerator to thaw slightly.